Having been crowned champions of Série A (Access Group) in 2018, the samba school G.R.E.S. Unidos do Viradouro will return to the top-tier Grupo Especial in 2019 with the parade ‘Viraviradouro!’ which centers around the stories of a magic book. RIO DE JANEIRO, BRAZIL – On Sunday, March 3rd, samba school G.R.E.S. Unidos do Viradouro will once again compete in the Grupo Especial with their parade scheduled to begin at 10:20 PM. The group will present their ‘samba enredo’ (thematic samba composition) along the theme of ‘Viraviradouro!’ celebrating their return to the top-tier of samba school with a presentation of stories from a magical book. The ‘rainha de bateria’ (queen of the drum) for Unidos do Viradouro this year will be Raíssa Machado, who has held the position since 2014, photo courtesy of Raphael David/Riotur. The samba school will be celebrating their return to the Grupo Especial this year after triumphing in 2018’s Série A (Access Group) last year with their parade entitled ‘Vira a Cabeça, Pira o Coração – Loucos Gênios da Criação’ (Turn the Head, Make the Heart Crazy – Mad Geniuses of Creation). Before 2018’s triumph, Unidos do Viradouro spent two years in Série A, finishing third in 2016 and second in 2017. The school is often simply known as ‘Viradouro,’ named after the municipality in Niterói were the school was founded in 1946. In 1949 Viradouro began to parade in the Niterói Carnival competition, which is a separate championship from the Rio de Janeiro Carnival competition. For forty years the school continued to compete in the Niterói Carnival competition until 1989 when they entered the main Carnival competition in Rio de Janeiro. Viradouro quickly gained recognition and by 1991 they were competing in the Grupo Especial, where they stayed continuously for almost twenty years. From 1994 to 2000, under the six-year stewardship of renowned Carnavalesco (Carnival Designer) Joãosinho Trinta, the group consistently finished in the top-half of the Grupo Especial. And in 1997, Viradouro won their first and only Carnival championship with a samba enredo centered around the theme of ‘Trevas! Luz! A explosão do universo’ (Darkness! Light! The explosion of the universe). After another decade of successes, the group fell into Série A, returning briefly to the Grupo Especial when they won promotion with their spectacular parade entitled ‘Sou a Terra de Ismael, “Guanabaran” eu vou Cruzar… Pra Você Tiro o Chapéu, Rio eu vim te Abraçar’ (I am Ishmael’s Land, ‘Guanabaran’ … I am going to cross for you. For you I tip my hat. Rio I came to embrace you) which was directed by Carnavalesco João Vitor Araújo. 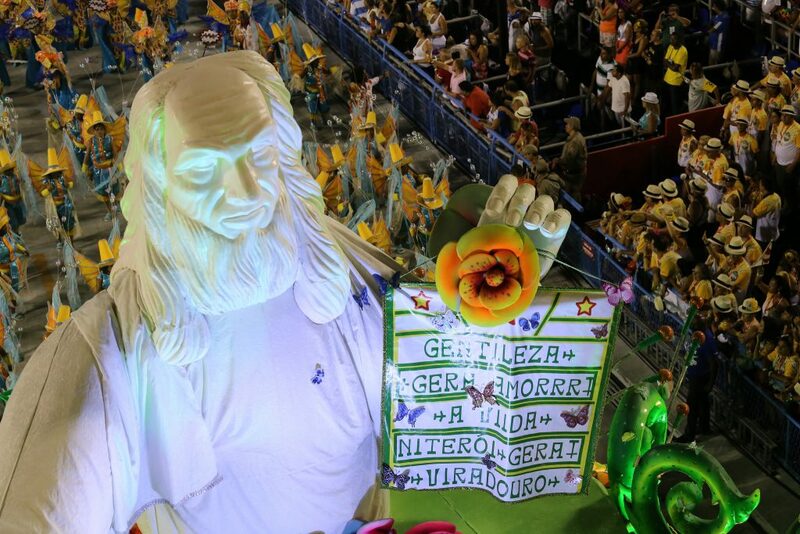 2014’s triumphant parade depicted the school’s origins in Nitéroi, and its journey to Rio de Janeiro, a city to which it paid homage; however, their 2015 parade saw them finish in twelfth place, earning them relegation straight back to Série A, where they stayed until last year’s victory, photo courtesy of Tata Barreto/Riotur.